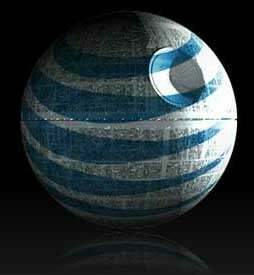 New York AT&T sufferers rejoice, for the Death Star claims that they have finalized the deployment of 1,600 850MHz 3G cells. What does this jibba jabba mean? "Improved connectivity, performance and enhanced in-building wireless coverage." Sure. According to AT&T, this upgrade is part of their plans to enhance their 3G network but, quite frankly, I'm not seeing much improvement here. At least, not in the farmer's market of Union Square on a Sunday morning, when everyone and their dogs are trying to get their email and Yelp fix in their iPhones with designer covers. I keep having exactly the same connectivity problems as before, both in Manhattan and in Brooklyn. The reason for not seeing any obvious performance upgrades is simple. They have not turned on 1,600 new 3G cells at once. The deployment has been gradual, and they just finished it. So if you haven't noticed any improvement in reception or data rates in your area, chances are anything improvements you see are going to be slightly more gradual through the usual ongoing deployments and upgrades. That said, you might notice it's slightly better indoors, since 850MHz penetrates buildings a bit better. AT&T told us that they're still tweaking the upgrades, however, so we may still see some minor improvements here and there.